Red Cross and Red Crescent volunteers and staff risk their lives every day. Thousands have been killed while carrying out their service, and many more are detained, tortured and injured, sometimes critically. They also frequently experience significant psychological trauma themselves – as currently witnessed in the fight against Ebola. Local staff and volunteers are always the first to respond to crises, as members of the communities they assist. The work of our volunteers and staff brings comfort, relief and often life-saving assistance to people facing the most dire of consequences of disasters, health emergencies and conflicts, yet the safety and access of these humanitarian workers is no longer guaranteed in these environments. The capacity of the Red Cross Red Crescent to respond rapidly and effectively to crises hinges critically on its local networks of volunteers and staff. Ensuring they are adequately prepared, trained, supported and protected in their work is a shared responsibility of the Red Cross and Red Crescent Movement (Movement) and States. to enable support mechanisms that are vital to the well-being of volunteers and staff. These include: safe access to help people and communities in need; promoting psychological support; making available personal protective equipment; and investing in training, including workplace safety and security management. The Movement will report on progress at its statutory meetings in 2017, and a final report with recommendations will feature as a topic of the 33rd International Conference in 2019. 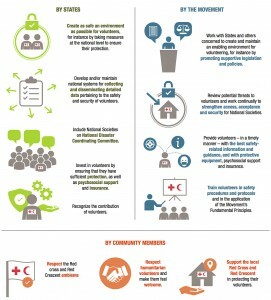 What conclusions did the 32nd International Conference of the Red Cross and Red Crescent reach on the subject of the safety and security of humanitarian volunteers?